The Hamilton Beach digital coffee maker was tested alongside hundreds of other coffee makers to help bring you some impartial advice on which coffee maker will be best for you and your needs. There are so many options out there that making a choice can be difficult and doing the level of research required to fully understand each machine is so time consuming. It’s a risk that you end up with a machine that doesn’t really suit your lifestyle. That’s why we have spent the time and done the research for you. Programmable clock: The clock can be programmed to ensure the machine automatically shuts off after two hours. This is a reusable filter which you can purchase for less than $6 and is used instead of filter papers. Although it comes with the slight inconvenience of having to be washed between uses, it will save you money on papers. If you would rather wash a filter rather than spend extra money, then this is for you! Pop out the coffee filter using the button and fill with the desired amount of coffee. Fill up the water reservoir to the desired level. The machine takes around twelve minutes to make a twelve cup pot. This machine is perfect for anyone who wants the convenience of a digital machine on a low budget. It’s a good choice for anyone who wants a stronger coffee as the bold option really does taste stronger than the regular option. This machine isn’t ideal for anyone who likes to wake up to a freshly brewed pot of coffee as there are no options to pre-set a pot. It’s also not good for anyone who has quite narrow kitchen tops with over head cabinets because of the excessive steam. 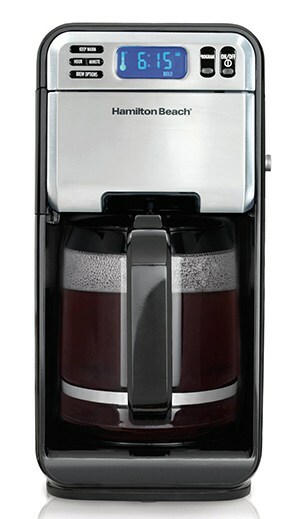 Overall, this H﻿amilton Beach 12-Cup brewer is a sturdy little machine that makes good coffee with very little effort. It had enough options to be able to customise your coffee to your tastes without having to spend hours working out how to use the functions and experimenting with settings.